On April 7-8, 2018 the Peggy Kirk Bell Girls’ Golf Tour played the PKBGT MASTERS presented by Aunt Ruby’s Peanuts at Greenville Country Club in Greenville, NC. Greenville Country Club, home of the East Carolina University Pirates women’s golf team, is a classic course for this two-day tournament. The event features a field of 79 players from the PKB Girls’ Golf Tour, the nation’s largest “girls’ only” junior tour. In 2017, Amanda Sambach (Davidson, NC 2021) claimed the title by 2 strokes with a round 1 score of 1-under par, 71, and a round 2 score of 77 with a two day total of 148. This year, the Bell National Series was set to play 36 holes on Saturday and 18 holes on Sunday, but inclement weather shortened the event to 36 holes. The Bell Series Champion is Riley Hamilton (Reidsville, NC 2020) with a score of 74-76-150. Finishing runner-up just 1 stroke behind the leader was Madison Isaacson (Greensboro, NC 2018) and Melissa Meng (Blacksburg, VA 2020) with two day totals of 151. Emily Hawkins (Lexington, NC 2018) finished in fourth place with a score of 79-75- 154. Rounding out the top 5 scores of 77-78-155 was Lauren Freyvogel (Gibsonia, PA 2019). The Champion of the Prep Preview Series is Ella Kue (King Mountain, NC 2023) with a score of 80-79- 159. Finishing tied for runner-up just 1 stroke behind the leader is Carly Whittington (Kinder, LA 2020) and Annabelle Jennings (Chesapeake, VA 2020) with a two-day total of 160. Katie Park (Fairfax, VA 2022) finished in fourth place with a score of 80-82-162. Finishing in fifth place is Trinity Muthomi (Kernersville, NC 2022) with a score of 79-85-164. The Champion of the Futures Series is Liza Lapeyre (New Orleans, LA 2022) with a score of 77-83-160. Finishing runner-up just 2 strokes behind the leader is Megan Morris (Cary, NC 2021) with a score of 80-82-162. In a tie for third place were Amelia Cho (Ashburn, VA 2024) and Reagan Southerland (Atlanta, GA 2023) with a two day total of 168. Finishing in a tie for fifth place with two day totals of 169 were Autumn Carey (Manning, SC 2022) and Phoenix Smith (Chesapeake, VA 2020). The weekend’s event also was the final event of the PKBGT Prep Preview Series, in which 5 players were recognized for the series ending Order of Merit standings. Winning the 2018 Prep Preview Order of Merit was Hannah Jonely (Ashburn, VA 2020) who edged out 2nd place by just two points. 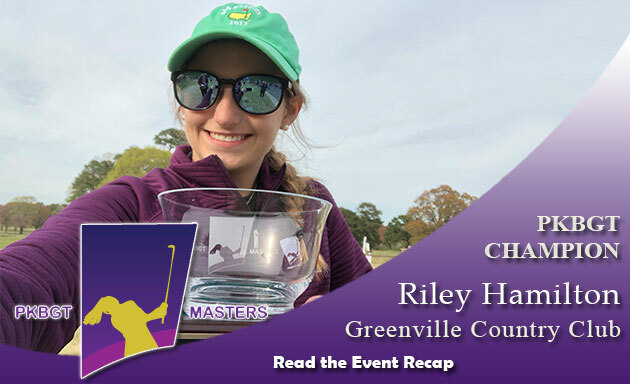 Hannah was victorious at the 2017 Tournament of Champions presented by Golf Pride this past December at Pinehurst #8. In 2nd place on the Order of Merit standings was Trinity Muthomi (Kernersville, NC 2022). Trinity played in 4 Prep Preview events with her top finish of 3rd place at the 2018 Palmetto Classic. In 3rd place on the Order of Merit was Kayla Bartemeyer (Mount Pleasant, SC 2020). Not only was Kayla’s best finish a 4th place finish at the 2018 Palmetto Classic but she her performance in the Prep Preview division helped earn her a spot in the 2018 Women’s Health Classic Junior Qualifier last month. Fourth on the Prep Preview Order of Merit was Grace Holcomb (Wilmington, NC 2021). Grace’s propelled her way to the top 5 of the Prep Preview Order of Merit with a 2nd place finish at the 2017 Tournament of Champions. Rounding out the top 5 was Halynn Lee (Cary, NC 2021), in which her 3 top 10 finishes in the Prep Preview Division helped earn her a spot in the top 5 of the PKBGT Prep Preview Order of Merit. The PKBGT is back in action April 14-15 with the Southeast Classic at Columbia CC, a new national event for 2018! We look forward to a great event. The Peggy Kirk Bell Girls’ Golf Tour is an initiative of the Triad Youth Golf Foundation, a 501(c)3 non-profit foundation aimed at increasing learning and playing opportunities for youth golfers. Based out of Greensboro, North Carolina, the PKBGT offers affordable, high-quality nationally ranked girls’ golf tournaments designed to prepare junior girls’ golfers for high school and collegiate golf. The PKBGT is the nation’s largest “girls’ only” junior tour with over 750 members in 2017 and over 650 girls playing in or committed to collegiate golf. Learn more about the tour at pkbgt.org or by contacting Tour Director Mike Parker at mparker@pkbgt.org or 336-347-8537.